There are a number of songs that, if it's the right word, celebrate FLLD, foreign language learning disability. At least I think that is what doughty old ex-pro gambler Chip is singing, at first to and then with winsome fiddler Rodrigues, and going on about. Or maybe not, but there seems quite a canon of songs around the apparent, um, boost that might be given to an ad-hoc liaison if one participant, usually the woman, contrives to talk dirty in foreign. The stuff of lone men without names, stalking the windswept borderlands, seeking what solace they can, after-hours in the cantinas, with dark-eyed damsels. Usually ahead of shooting everyone to bits. Or being shot. If cinema is slower to embrace such themes these days, americana certainly ain't lagging. Chip Taylor actually was a professional gambler, it made more money than the sweatshop songwriting he was signed up for. And he was quite successful at that too, certainly more so than his original desire, of following his dad into pro-golf. Calling himself a tune-tailor, from the late 50s to a decade or so later he wrote songs that became hits for a remarkable diversity of acts. Perhaps the best known is 'Wild Thing', originally by Jordan Christopher and the Wild Ones, but memorably later picked up by UK west country band the Troggs, and, thence, Jimi Hendrix. But he also penned 'Angel of the Morning' and 'Try (Just a Little Bit Harder)', demonstrating his cross-genre ease between rock, country and soul. But the horses and casinos paid more, at least until he was banned. So, at age 53, he picked up his guitar again. Carrie Rodrigues, a classically trained violinist who had switched to fiddle after witnessing a Lyle Lovett soundcheck, caught his eye and they became a team, putting out 4 duet albums between 2001 and 2006, his rough hewed outlaw tones blending with her sweeter voice and stunning playing. She has since built up a strong solo repertoire, although not beyond still performing the odd new song, as penned by, she says, "one of our greatest songwriters of all time", erstwhile sparring partner Taylor. He himself continues to perform and produce music, in 2016 being inducted into the Songwriters Hall of Fame, at the same time as running his own label, Trainwreck Records. Here's a nice version of Taylor and Rodrigues together, playing 'Wild Thing'. Now, before we lose entirely my indulgence around the aphrodisiacal enticements of endearments en espagnol, we shouldn't forget the disappointment when it fails to materialise, as drawn into focus by Mssrs. Sahm, Meyers, Fender and Jimenez, the estimable tex-mex supergroup, the Texas Tornadoes and their complementary paean, 'She Never Spoke Spanish to Me', actually written by erstwhile Flatlander, Butch Hancock. Founded in 1979 at the San Francisco Art Institute, when Iyall, having recently seen Patti Smith perform, got together with fellow student, bass player Frank Zincavage. They added guitarist Peter Woods and drummer Jay Derrah, and christened themselves “Romeo Void.” Saxophonist Benjamin Bossi was added shortly thereafter, and Derrah left before the band recorded their first full album, leading to an almost Spinal Tap-esque parade of drummers. 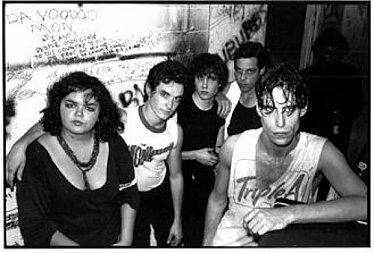 Romeo Void’s biggest hit “A Girl In Trouble (Is A Temporary Thing),” came from their last album, 1984's more mainstream sounding Instincts, so it really seems that Columbia Records’ weight shaming based lack of support might have cost them a successful band. Iyall ended up leaving the music business for years, teaching art and engaging in projects to work with and train fellow Native Americans, although she has, recently, dipped her toe back into recording and performing. I don’t believe that any of the other members of the band had much of a musical career outside of Romeo Void. They were an excellent live band, too—here’s a clip of “Talk Dirty (To Me)” from a show in 1981, and you can see what I am talking about. No one seemed to care that the lead singer wasn’t a stick figure. It was about this time that I interviewed the band, something that I alluded to in another column, before they performed at Trenton’s City Gardens. Having done a bit more research into the club’s calendar, I believe that the interview was in March, 1982, when they played there, with local heroes Regressive Aid opening. There’s a reference in the City Gardens’ oral history book, No Slam Dancing, No Stage Diving, No Spikes, to the band coming to WPRB for an interview drunk in July, 1981, when school was out and I was in Europe, so I think that Randy Now, City Garden’s leader, has mixed up the two dates. As I have mentioned, during the interview, Iyall acted really annoyingly, blurting out profanities and doodling penises on scrap paper, so if she was drunk, that makes some sense. In any event, she has noted in another interview, "I do like to be provocative, and I definitely have access to my sexuality, and as a topic I find it ripe.” She did, however, agree to do a station ID, which you can find here, along with probably way more than you ever want to know about my time at WPRB. In my early days on Facebook, I found that Iyall and I had a mutual friend, who herself is a sexually provocative performance artist, so it didn’t surprise me. Now, both of them block access to their friend lists, so I can’t see if that relationship has continued, but there are times that I want to reach out to Iyall and ask her if she remembers the interview, which all of us at WPRB involved in the event have not forgotten.